This is the third instalment of a four-part series, Unsafe in any County, by Special Project Coordinator Jeremy Dechert. The series focuses on the dangers posed by historic automobiles or automobile components and is inspired by the museum’s growing database of historical digitized newspapers from across Huron County. These newspapers can be accessed by visiting our website. In our previous two instalments, we focused on the dangers of the 1953 Buick Roadmaster’s braking system, and the dangers and innovations of early automobile windshields. This week we will be discussing the infamous Chevrolet Corvair, a vehicle that was thrust to the forefront of a national vehicle safety campaign. To some it was a menace; to others, it was merely a scapegoat. In the late 1950s, Chevrolet wanted to break into the compact car market. European imports like the Volkswagen Beatle and the newly released Studebaker-Packard Lark were selling well and Chevrolet wanted to take a chunk out of their market share. Only one domestically produced compact vehicle was being sold at this time, the AMC American Rambler. 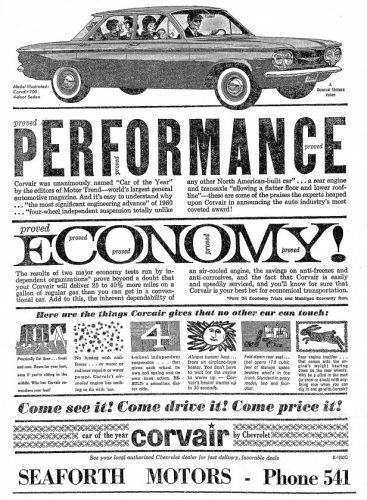 In 1959, Chevrolet released their infamous Corvair. It marked a significant change for Chevrolet. Instead of placing the engine in the front of the car, it was moved to the back. The suspension system incorporated a swing axel design, allowing each wheel to independently absorb impacts. The modifications made for the Corvair were touted as a being practical by allowing for more floor space, reducing engine noise and heat, and providing better handling and suspension. 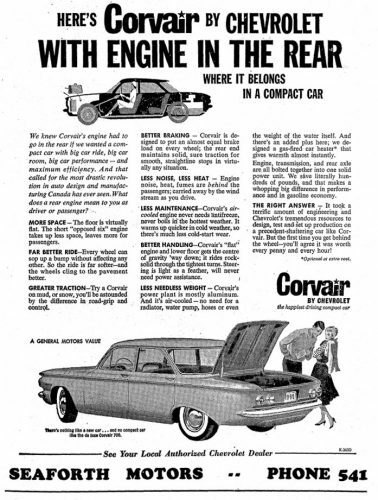 The Corvair’s suspension system may have made for a smooth ride when passing over bumps, but flexibility of the axels made the Corvair’s wheels susceptible to tucking under the vehicle when taking sharp turns. This could result in the vehicle skidding out of control or tipping over. Compounding this issue was the fact the vehicle’s engine was located in the rear. This could generate quite a bit of momentum, exacerbating the traction issue. Like Buick did with their 1953 Roadmaster, Chevrolet provided a factory-made modification package to address the shortcomings of the Corvair. The package was offered as early as 1961 and provided more substantial suspension springs and shock absorbers, a front stabilizer bar, and rear axle round straps to reduce wheel tuck under. However, like Buick, Chevrolet did not openly advertise this modification package. It was also factory installed. 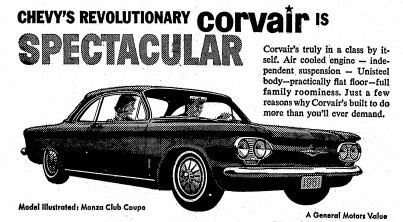 This meant that the average, less-informed, Corvair driver would either not know about the package or see its value. Also like Buick, Chevrolet was hit with lawsuits filed by aggrieved customers. In 1965, three lawsuits were filed against GM for alleged vehicle instability. Two were won by GM and one was not. In none of the cases was information on technical data or test results revealed. The safety of the Corvair was brought to light by Ralph Nader in his book Unsafe at Any Speed. He took Chevrolet to task for disregarding of the Corvair’s safety issues once they came to light. The unethical nature of Chevrolet’s response to Nader’s book and public safety campaign did not help Chevrolet’s image. They hired private detectives to find compromising information about Nader in order to discredit and silence him. However, according to a subsequent study for the National Highway Traffic Safety Administration, it was determined that the Corvair (1960-1963) was no more dangerous than similar vehicles produced by other manufactures. So, was Chevrolet unfairly singled out for creating an unsafe vehicle? Yes. But, were they unfairly criticized? No.